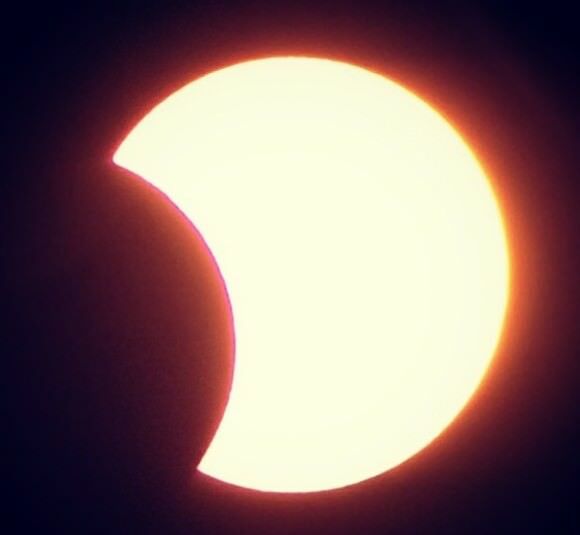 The May 2012 annular solar eclipse. Image credit and copyright: Kevin Baird. ‘Tis the season… eclipse season that is, as a spectacular “ring of fire” annular solar eclipse marks the end of the first of two eclipse cycles for 2017. And although the annular path for this eclipse passes through some sparsely populated parts of the southern hemisphere, we just might get some amazing live views, courtesy of modern technology and some intrepid observers willing to adventurously trek after the shadow of the Moon. Unlike many of the uncertainties in life, eclipses are sure to happen, a certainty ordained by orbital mechanics. Well, okay, the Vogons could always blow the Moon to smithereens this fine Thursday afternoon… but otherwise, we’re in for a true celestial show. Eclipse circumstances: Prospects and prognostications. The eclipse begins far out in the South Pacific at sunrise, and the path of annularity makes first landfall along the southern coast of Chile at 13:31 Universal Time (UT). The eclipse antumbra then races eastward over Argentina at 2.5 kilometers per second, as the “ring of fire” heads out over the South Atlantic where it reaches “maximum annularity” of just 44 seconds 900 kilometers southeast of Brazil. Finally, the 30 kilometer wide path touches down over Angola, nicks Zambia and ends at sunset over a southern track along the Democratic Republic of the Congo. The eclipse is partial across southern portion of South America, the Falkland Islands a swath of Antarctica and southwestern Africa. Sunday’s eclipse is the first of two solar eclipses for 2017, and the only annular eclipse for the year. We get an annular eclipse when the Moon is near apogee (which occurred eight days ago on February 18th) and the Earth is near perihelion (which occurred last month on January 4th). At this time, the apparent size of the Moon is too small to cover the Sun as seen from the Earth, resulting instead in a brilliant annulus or “ring of fire” in the sky. Likewise, we refer to the shadow trace of this ring across the Earth as an antumbra, instead of the familiar umbra of a total solar eclipse. Strange as it may seem, annular eclipses are slightly more common than total solar eclipses in our current epoch, and will become increasingly more so as the Moon slowly recedes from the Earth. The alignment needed for an annular eclipse. Credit: The National Observatory of Japan. Unlike a total solar eclipse, safety precautions must be taken during all phases of an annular solar eclipse. We witnessed the 1994 annular eclipse from the shores of Lake Erie, and can attest that 1% of the Sun is still pretty darn bright. Use only telescope and camera filters or glasses designed specifically for solar observing, even during the annular phase. Venus should also be a splendid sight for those observing near sunset from Africa, as the Cytherian world shines at -4.3 magnitude 34 degrees east of the Sun. Viewers in southwestern African nations will also be treated to a setting Sun during the eclipse, affording the chance to include the spectacle in shots along with foreground objects on the local horizon if skies are clear. The eclipse versus Venus as seen from the path through Angola. Credit: Stellarium. the venerable SLOOH plans to webcast the eclipse. Watch this space: we’ll be dropping in more live webcasts of the eclipse as they turn up. Update: VTR Chile may provide a live broadcast come eclipse time. Plan on doing an ad hoc webcast of Sunday’s eclipse from anywhere along the annular or partial track? Let us know! Sunspot activity is currently at a lull, and the Earthward face of Sol may well be blank come eclipse day. At an eclipse magnitude of 99.22%, this eclipse juuuusst misses being a hybrid/total. It’s also possible to catch the brief flashes of Bailey’s Beads along the edge of the antumbral graze line. This eclipse is member 29 of 71 for saros cycle 140, stretching all the way back to April 16th, 1512 and running out to June 1st, 2774. If you caught the February 16th, 1999 annular eclipse from the Australian Outback, then you witnessed the last eclipse in saros 140. Stick around until March 9th, 2035 and you can then complete an exeligmos or triple saros cycle, joining an elite club of eclipse-chasing adventurers, indeed. Eclipses occur in pairs or sometimes triplets, when the nodes where the Moon’s orbit intersect the position of the Sun and the Earth’s shadow along the ecliptic plane. These nodes move due to orbital precession of the Moon’s path around the Earth. If the Moon weren’t inclined relative to the ecliptic, we’d see a lunar and solar eclipse every synodic month. The February 11th penumbral eclipse ushered in the current eclipse season, which ends with this weekend’s annular eclipse. The penumbral eclipse from earlier this month, ushering in eclipse season 1 of 2 for 2017. Credit and Copyright: Rob Sparks. There is an ISS transit over SW Africa at around 15:45 UT, offering a chance to catch a transit of the station across the partially eclipsed Sun. Sun observing spacecraft in low Earth orbit including Hinode and Proba-2 also usually get good views of the eclipse. New Moon sightings: And for the rest of the world, the hunt will be on to recover the slim waxing crescent Moon post-eclipse on the evening of Monday, February 27th. This lunation, first sighting opportunity without optical assistance favors southeast Asia. Then, its on to eclipse season number two, featuring a partial lunar eclipse on August 7th, and then the big ticket event: the total eclipse of the Sun spanning the contiguous United States from coast to coast. Umbraphiles have been planning for this one and its brief 160 seconds maximum of totality for well over a decade now, no lie. Where will YOU be? -Send those eclipse pics in to Universe Today Flickr. -Read more about eclipses, occultations, comets and more for the year in our free e-book: 101 Astronomical Events for 2017. -Eclipse science fiction? Read our original sci-fi tales Exeligmos, The Syzygy Gambit, Peak Season and more. What if someone were to tell you that there’s a region in the world where roughly 90% of the world’s earthquakes occur. What if they were to tell you that this region is also home to over 75% of the world’s active and dormant volcanoes, and all but 3 of the world’s 25 largest eruptions in the last 11,700 years took place here. Chances are, you’d think twice about buying real-estate there. But strangely enough, hundreds of millions of people live in this area, and some of the most densely-packed cities in the world have been built atop its shaky faults. We are talking about the Pacific Ring of Fire, a geologically and volcanically active region that stretches from one side of the Pacific to the other. Also known as the circum-Pacific belt, the “Ring of Fire” is a 40,000 km (25,000 mile) horseshoe-shaped basin that is associated with a nearly continuous series of oceanic trenches, volcanic arcs, and volcanic belts and/or plate movements. This ring accounts for 452 volcanoes (active and dormant), stretching from the southern tip of South America, up along the coast of North America, across the Bering Strait, down through Japan, and into New Zealand – with several active and dormant volcanoes in Antarctica closing the ring. The Ring of Fire is the direct result of plate tectonics and the movement and collisions of lithospheric plates. These plates, which constitute the outer layer of the planet, are constantly in motion atop the mantle. Sometimes they collide, pull apart, or slide alongside each other; resulting in convergent boundaries, divergent boundaries, and transform boundaries. These ocean trenches and volcanic arcs run parallel to one another. For instance, the Aleutian Islands in the U.S. state of Alaska run parallel to the Aleutian Trench. Both geographic features continue to form as the Pacific Plate subducts beneath the North American Plate. Meanwhile, the Andes Mountains of South America run parallel to the Peru-Chile Trench, created as the Nazca Plate subducts beneath the South American Plate. In the case of divergent boundaries, these are formed when tectonic plates pull apart, forming rift valleys on the seafloor. When this happens, magma wells up in the rift as the old crust pulls itself in opposite directions, where it is cooled by seawater to form new crust. This upward movement and eventual cooling of this magma has created high ridges on the ocean floor over millions of years. The East Pacific Rise is a site of major seafloor spreading in the Ring of Fire, located on the divergent boundary of the Pacific Plate and the Cocos Plate (west of Central America), the Nazca Plate (west of South America), and the Antarctic Plate. The largest known group of volcanoes on Earth is found underwater along the portion of the East Pacific Rise between the coasts of northern Chile and southern Peru. A transform boundary is formed when tectonic plates slide horizontally and parts get stuck at points of contact. Stress builds in these areas as the rest of the plates continue to move, which causes the rock to break or slip, suddenly lurching the plates forward and causing earthquakes. These areas of breakage or slippage are called faults, and the majority of Earth’s faults can be found along transform boundaries in the Ring of Fire. The San Andreas Fault, stretching along the central west coast of North America, is one of the most active faults on the Ring of Fire. It lies on the transform boundary between the North American Plate, which is moving south, and the Pacific Plate, which is moving north. Measuring about 1,287 kilometers (800 miles) long and 16 kilometers (10 miles) deep, the fault cuts through the western part of the U.S. state of California. The eastern section of the Ring of Fire is the result of the Nazca Plate and the Cocos Plate being subducted beneath the westward moving South American Plate. Meanwhile, the Cocos Plate is being subducted beneath the Caribbean Plate, in Central America. A portion of the Pacific Plate along with the small Juan de Fuca Plate are being subducted beneath the North American Plate. Along the northern portion, the northwestward-moving Pacific plate is being subducted beneath the Aleutian Islands arc. Farther west, the Pacific plate is being subducted along the Kamchatka Peninsula arcs on south past Japan. The southern portion is more complex, with a number of smaller tectonic plates in collision with the Pacific plate from the Mariana Islands, the Philippines, Bougainville, Tonga, and New Zealand. This portion excludes Australia, since it lies in the center of its tectonic plate. Indonesia lies between the Ring of Fire along the northeastern islands adjacent to and including New Guinea and the Alpide belt along the south and west from Sumatra, Java, Bali, Flores, and Timor. The famous and very active San Andreas Fault zone of California is a transform fault which offsets a portion of the East Pacific Rise under southwestern United States and Mexico. Most of the active volcanoes on The Ring of Fire are found on its western edge, from the Kamchatka Peninsula in Russia, through the islands of Japan and Southeast Asia, to New Zealand. Mount Ruapehu in New Zealand is one of the more active volcanoes in the Ring of Fire, with yearly minor eruptions, and major eruptions occurring about every 50 years. Krakatau, perhaps better known as Krakatoa, is an island volcano in Indonesia. Krakatoa erupts less often than Mount Ruapehu, but much more spectacularly. Beneath Krakatoa, the denser Australian Plate is being subducted beneath the Eurasian Plate. An infamous eruption in 1883 destroyed the entire island, sending volcanic gas, volcanic ash, and rocks as high as 80 kilometers (50 miles) in the air. A new island volcano, Anak Krakatau, has been forming with minor eruptions ever since. Mount Fuji, Japan’s tallest and most famous mountain, is an active volcano in the Ring of Fire. Mount Fuji last erupted in 1707, but recent earthquake activity in eastern Japan may have put the volcano in a “critical state.” Mount Fuji sits at a “triple junction,” where three tectonic plates (the Amur Plate, Okhotsk Plate, and Philippine Plate) interact. The Ring of Fire’s eastern half also has a number of active volcanic areas, including the Aleutian Islands, the Cascade Mountains in the western U.S., the Trans-Mexican Volcanic Belt, and the Andes Mountains. Mount St. Helens, in the U.S. state of Washington, is an active volcano in the Cascade Mountains. Below Mount St. Helens, both the Juan de Fuca and Pacific plates are being subducted beneath the North American Plate. Its historic 1980 eruption lasted 9 hours and covered 11 U.S. states with tons of volcanic ash. The eruption caused the deaths of 57 people, over a billion dollars in property damage, and reduced hundreds of square miles to wasteland. Popocatépetl is one of the most active and dangerous volcanoes in the Ring of Fire, with 15 recorded eruptions since 1519. The volcano lies on the Trans-Mexican Volcanic Belt, which is the result of the small Cocos Plate subducting beneath the North American Plate. Located close to the urban areas of Mexico City and Puebla, Popocatépetl poses a risk to the more than 20 million people that live close enough to be threatened by a destructive eruption. Scientists have known for some time that the majority of the seismic activity occurs along plate boundaries. Hence why roughly 90% of the world’s earthquakes – which is estimated to be around 500,000 a year, one-fifth of which are detectable – occur around the Pacific Rim, where multiple plate boundaries exist. As a result, earthquakes are a regular occurrence in places like Japan, Indonesia and New Zealand in Asia and the South Pacific; Alaska, British Columbia, California and Mexico in North America; and El Salvador, Guatemala, Peru and Chile in Central and South America. Where fault lines run beneath the ocean, larger earthquakes in these regions also trigger tsunamis. The most well-known tsumanis to take place in the Ring of Fire include the 2004 Indian Ocean earthquake and tsunami. This was the most devastating tsunami of its kind in modern times, killing around 230,000 people and laying waste to communities throughout Indonesia, Thailand, and Southern Asia. In 2010, an earthquake triggered a tsunami which caused 4334 confirmed deaths and devastating several coastal towns in south-central Chile, including the port at Talcahuano. The earthquake also generated a blackout that affected 93 percent of the Chilean population. In 2011, an earthquake off the Pacific coast of Tohoku led to a tsunami that struck Japan and led to 5,891 deaths, 6,152 injuries, and 2,584 people to be declared missing across twenty prefectures. The tsunami also caused meltdowns at three reactors in the Fukushima Daiichi Nuclear Power Plant complex. The Ring of Fire is a crucial region for many reasons. It serves as one of the main boundary regions for the tectonic plates of over half of the globe. It also affects the lives of millions if not billions of people who live in these regions. For many of the people who live in the Pacific Ring of Fire, the reality of a volcanic eruption or earthquake is commonplace and a challenge they have come to deal with over time. At the same time, the volcanic activity has also provided many valuable resources, such as rich farmland and the possibility of tapping geothermal activity for heating and electricity. As always, nature gives with one hand and takes with the other! If you have enjoyed this article there are several others on Universe Today that you will find interesting. Here is one called 10 Interesting Facts About Volcanoes. There is also a great article about plate tectonics. You can also find some good resources online. There is a companion site for the PBS program Savage Earth that talks about the Ring of Fire. You can also check out the USGS site to see a detailed map of the Pacific Ring of Fire and more detailed information about plate tectonics. You can also listen to Astronomy Cast. Episode 141 talks about volcanoes. A spectacular annular eclipse of the Sun was witnessed across Australia and the southern Pacific region early today. Morning dawned mostly clear across the Australian continent, and those who journeyed out to meet the antumbra of the Moon as the Sun rose across the Great Sandy Desert and the Cape York Peninsula were not disappointed. The rest of us watched worldwide on as Slooh and a scattering of other ad-hoc broadcasts delivered the celestial event to us via the web. A rising crescent eclipse as seen by Druce Horton near Kurunda, Australia. (Credit and Copyright: Druce Horton. Used with Permission). The rising annular eclipse. (Credit: Geoff Sims). Annularity just moments after internal contact of the antumbra. Credit: Joerg Schoppmeyer). We also mentioned earlier this week how you can use the “strainer effect” to create a flock of crescent Suns during a partial solar eclipse. An Astropixie Eclipse… (Credit: Amanda Bauer). A lens flare eclipse. (Credit: CDSCC/NASA). A pinhole eclipse. (Credit: Trevor Sellman). The solar annulus as seen near mid-eclipse in hydrogen alpha. (Credit: the CCSSC). A screen capture of the final stage of the eclipse as seen in Cal-K. (Credit: the CCSSC). “These images interest Russian space enthusiasts because we asked Roskosmos to optimize (the) work of satellite for best pictures of eclipse,” Vitaliy Egorov told Universe Today. There’s no word as of yet if the NASA/JAXA spacecraft Hinode or if ESA’s Proba-2 caught the eclipse, although they were positioned to take advantage of the opportunity. A partially eclipsed Sun. (Credit: @nessyhill). Partial stages of the eclipse were also captured by Carey Johnson (@TheTelescopeGuy) from Hawaii and can be viewed on his flickr page. If this eclipse left you jonesin’ for more, there’s a hybrid solar eclipse across the Atlantic and central Africa on November 3rd 2013. Maximum totality for this eclipse is 1 minute and 40 seconds. Unfortunately, after two solar eclipses in 6 months, another total solar eclipse doesn’t grace the Australian continent until July 22nd, 2028! But such are the ways of the cosmos and celestial mechanics… hey, be glad we occupy a position in space and time where solar eclipses can occur. Thanks to all who sent in photos… if you’ve got a picture of today’s eclipse, an anecdote, or just a tale of triumph and/or eclipse chasing tribulations drop us a line & share those pics up to the Universe Today flickr group. See you next syzygy, and may all your eclipse paths be clear! The first solar eclipse of 2013 is upon us this week, with the May 10th annular eclipse crossing northern Australia and the Pacific. 2013 is an off year for eclipses. There are five eclipses this year, three lunars and two solars. Last month’s very shallow partial lunar eclipse set us up for the annular that occurs this week. In fact, the theoretical mid-point for the first of two eclipse seasons for 2013 occurs on May 7th at 7:00 UT/ 3:00 EDT when the longitude of the Sun equals the descending node where the Moon’s path crosses the ecliptic. This further sets us up for the third and weakest eclipse of the year, a grazing penumbral on May 25th. Animation of the path of this week’s annular solar eclipse. (Credit: NASA/GSFC/A.T. Sinclair). An annular eclipse occurs when the Moon eclipses the Sun while near apogee and is hence visually too small to entirely cover the Sun. The Moon reaches apogee on May 13th at 13:32 UT/9:32AM EDT at 405,826 kilometres from Earth, just 3 days and 13 hours past New. Annulars are currently more common than total solar eclipses, occurring 33.2% of the time in our current 5,000 year epoch versus 26.7% for total solar eclipses. The remainders are hybrid and partial eclipses. Annulars will become even more common as our Moon recedes from us at a current rate of about 3.8 centimetres a year. In about 1.4 billion years, the final brief total solar eclipse as seen from the Earth will occur. Likewise, somewhere back about 900 million years ago, the very first annular eclipse as seen from the Earth occurred. Solar viewing with a properly fitted glass white light filter over the aperture of a Schmidt-Cassegrain telescope. (Photo by Author). Safety is paramount while viewing an annular solar eclipse. As mentioned above, an annular eclipse throughout all phases is much brighter than you’d expect. Thus precautions to protect your eyes MUST be taken throughout ALL phases of the eclipse. Permanent eye damage can result from staring at the Sun without proper protection, and this can be near instantaneous when done through an unfiltered telescope! We witnessed the 1994 annular eclipse from the shores of Lake Erie, and can tell you that 5% of the Sun is still extremely bright. You wouldn’t even know an annular eclipse was underway at midday unless you were looking for it. Use only filters approved for eclipse viewing that fit snugly over the FRONT of your optics. Throw those old eyepiece screw-on filters away, as they can heat up and crack! Check filters before use and never leave a telescope aimed at the Sun unattended. Projecting the Sun is another option via a telescope or “Sun Gun,” but again, never leave such a rig unattended, and keep finderscopes covered at all times. Also, telescopes with folded optical paths such as Schmidt-Cassegrains can heat up to dangerous levels and should not be used for projecting the Sun. The path of the May 9th/10th annular eclipse across Australia & the Pacific. (Map courtesy of Michael Zeiler at Eclipse Maps, click to enlarge). This eclipse has a magnitude rating of 0.9544, meaning that 95.44% of the diameter of the Sun will be eclipsed at its maximum. Keep in mind, this leaves about 8.9% percent of the Sun, or about 1/11th of its visual area exposed. This translates to only a 2.5 magnitude drop in brightness. Thus, the brightness of the Sun will drop from magnitude -27 to -24.5, still well over 25,000 times brighter than the Full Moon! Note that this one crosses the International dateline as well. The action for this eclipse begins as the partial phases touch down over Western Australia at sunrise at 21:25 UT on May 9th (The morning of May 10th in Australia). The annulus makes its appearance at 22:30 UT over western Australia, with its 172 kilometre wide track racing to the northeast over Tennant Creek in the Northern Territories and crossing the Cape York peninsula as it crisscrosses the path of last November’s total solar eclipse just north of Cairns. A closeup of the path of the annular eclipse across Australia, click to enlarge. (Courtesy of Miichael Zeiler at Eclipse Maps). Note that the eclipse will be 80% partial near Alice Springs and Uluru (Ayers Rock), presenting an excellent photo op. Michael Zeiler at Eclipse Maps also points out that the area near the town of Newman in Western Australia will see an amazing sunrise annular eclipse. The path of the annular eclipse will then traverse the Coral Sea crossing over islands in eastern Papua New Guiana, the Solomon Islands and Kiribati before reaching greatest annularity with a duration of 6 minutes and 3 seconds at latitude 2° 13’ north and longitude 175° 28’ east. The path of annularity crosses over Bairiki Atoll and makes last landfall over Fanning Island north of Kiribati. Note that most of Australia, New Zealand, Indonesia and the Philippines will see partial phases of the eclipse. The islands of Hawaii across the dateline will also see a 40-50% partial eclipse on May 9th before the event ends in the eastern Pacific at 03:25:23 UT. Weather prospects for the eclipse look to be best along the track through Australia with less than 20% chance of cloud cover then getting progressively worse as the eclipse path tracks northeastward out to sea. The Solomon Islands region can expect cloud cover in the 60% range, while in Hawaii prospects are about 70%. Eclipser maintains a site dedicated to weather prospects for upcoming eclipses. Sunspot activity as of May 5th. (Photo by Author). This eclipse belongs to saros series 138 and is number 31 of 70. This saros started with a 2% partial solar eclipse on June 6th, 1472 and will end with a 12% partial on July 11th,2716 AD having produced 3 total, 1 hybrid, 16 partial and 50 annular eclipses. Fans of this saros may remember the last annular in this series which crossed South America on April 29th, 1995. A sequence of eclipse pictures taken from Huntington Beach, California on May 20th, 2012. (Credit: jimnista/Universe Today flickr gallery). Catching a rising annular eclipse can also make for a stunning photograph. To catch the eclipse and the foreground horizon in silhouette, a DSLR with a 400mm lens running at 1/500th of a second shutter speed or faster is a good combination. Remember, you’ll have to aim this via projection. DO NOT look through the camera at the Sun! Exposures slower than 1/200th of a second are also out of the question, as you can damage the camera sensor at slow exposures. Another cool effect to watch for is the appearance of tiny little “crescent Suns” littering the ground as sunlight streams through gaps in the tree leaves. This occurs because the gaps act like tiny little pinhole cameras. A spaghetti strainer is also a highly scientific apparatus that can be used to mimic this effect! Finally, if you’re like 99.99% of humanity, you’ll be watching this eclipse online. Slooh will be broadcasting this eclipse live. Also, the eclipse will be broadcast live via the Coca-Cola Space Science Center starting at 5PM ET. -Australian observer Gerard Lazarus’s live feed of the eclipse. –3News in New Zealand and Sky News Australia for eclipse coverage. Got an ad hoc eclipse broadcast planned? Let us know and we’ll include it! The next and final solar eclipse for 2013 is a hybrid (annular along one section of the path and total along another) on November 3rd across the mid-Atlantic and central Africa. Another annular eclipse doesn’t occur until April 29th 2014, and the next total solar eclipse occurs on March 20th, 2015. If you’re in the region be sure to catch this rare celestial event in person, or watch the action worldwide online! IF you don’t know anything about plate tectonics you might be wondering about what is a subduction zone. A subduction zone is a region of the Earth’s crust where tectonic plates meet. Tectonic plates are massive pieces of the Earth’s crust that interact with each other. The places where these plates meet are called plate boundaries. Plate boundaries occur where plates separate, slide alongside each other or collide into each other. Subduction zones happen where plates collide. When two tectonic plates meet it is like the immovable object meeting the unstoppable force. However tectonic plates decide it by mass. The more massive plate, normally a continental will force the other plate, an oceanic plate down beneath it. This is the subduction zone. When the other plate is forced down the process is called subduction. The plate enters into the magma and eventually it is completely melted. That is how the surface of the earth makes way for the crust created over time at other plate boundaries. Subduction zones have key characteristics that help geologist and seismologist identify them. The first is mountain formation. Subduction zones always have mountain ranges caused by plate subduction. The next is volcanic activity as a plate is subducted the pressure and heat turns it into magma. These pockets of magma find paths to the surface and create volcanoes. A good example is the subduction zone near Chile. The final sign is deep marine trenches. These are the best evidence of a subduction zone as they are visible evidence of the crease formed by subduction of a plate. The most famous is the Mariana Trench. There are some interesting theories about why Subduction occurs in the Earth’s crust. One common theory is that subduction was initiated by major impacts by asteroids or comets early in Earth’s history. This makes a lot of sense due to the geologic evidence of large impacts scattered around the world. Understanding how subduction zones work is important because it helps scientist to identify areas of high volcanic and seismic activity. Monitoring these areas can help them warn people who live near them of imminent events and also people who could be affected by the side effects of such events such as ash clouds or tsunamis. Subduction continues to be one of the most powerful and dynamic processes on planet Earth and as technology improves we can come to understand more about this amazing process. We have written many articles about the subduction zone for Universe Today. For example, here is one on the Ring of Fire and plate boundaries. You should also check out plate tectonics and subduction. If you’d like more info on the subduction zone, check out the U.S. Geological Survey Website. And here’s a link to NASA’s Earth Observatory. We’ve also recorded related episodes of Astronomy Cast about Plate Tectonics. Listen here, Episode 142: Plate Tectonics. Subduction is a process in geology where one tectonic plates slides underneath another one and merges into the Earth’s mantle. The denser plate is the one that slips under the less dense plate; the younger plate is the less dense one. The process is not a smooth one. The tectonic plates grate against each other, which often causes earthquakes. The plate that slips under does not stay that way. Due to the heat caused by it rubbing against the other plate as well as the natural heat of the mantle, the plate melts and turns into magma. The area where subduction occurs is known as the subduction zone. When one plate begins to slip underneath another one a trench is formed. The earthquakes that result due to the plates grinding against each other often cause magma to spill out through the trench in submarine volcanoes. Various formations such as mountain ranges, islands, and trenches are caused by subduction and the volcanoes and earthquakes it triggers. In addition to causing earthquakes, subduction can also trigger tsunamis. When the older plate is holding a continent however, it does not sink, which is reassuring. Instead, the less dense material slips into a trench behind the denser oceanic crust where it gets stuck. The pressure continues to build until the trench flips over and the less dense plate slips underneath the one with the continent. It is possible for a whole tectonic plate to disappear. This happens when the plate goes through subduction faster than new material can be added to the plate through seafloor spreading. The spreading pushes the plate slowly toward the subduction zone until the whole thing disappears. When this happens, the other tectonic plates rearrange to cover the area. Subduction zones are mainly located in the Pacific Ocean. This is because seafloor spreading – the process by which new oceanic crust is created – occurs mostly in the Pacific. Thus the new material pushes the older plates outward and then they need to undergo subduction. This also explains why so many earthquakes originate in the Pacific Ocean near the Ring of Fire. That is where the subduction zones are concentrated. Continental plates also converge, but this is not considered subduction because these plates do not have different densities and thicknesses to subduct. Landforms such as the Himalayas are formed from these convergences though.